According to a report by The Wall Street Journal, Apple have been meeting with a number of media company executives to discuss their plans for the “future of TV” – the Apple television. Apple Inc. is moving forward with its assault on television, following up on the ambitions of its late co-founder, Steve Jobs. In recent weeks, Apple executives have discussed their vision for the future of TV with media executives at several large companies, according to people familiar with the matter. 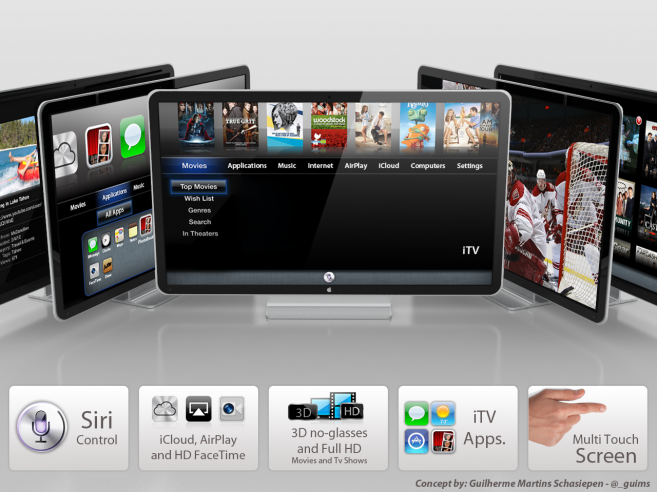 The report includes information from sources that the Apple TV will likely feature voice and movement-based control elements, iCloud-based media streaming, as well as the ability to use iOS enabled devices such as the iPhone and iPad in place of a traditional TV controller. A number of rumors regarding Apple’s television have emerged in recent weeks, with reports that the Apple TV is being manufactured by Sharp and will come in three sizes, ranging from 32 to 55 inches.